Brexit. Co-operative Principles in an Unprincipled World. It is ironic now, as we allegedly arrive at the Brexit endgame, as we stand a week away from the official leave date on the 29th March, to think that the EU was originally developed after the Second World War to encourage economic and political co-operation. Political co-operation, there’s something we’ve missed recently this side of la Manche. 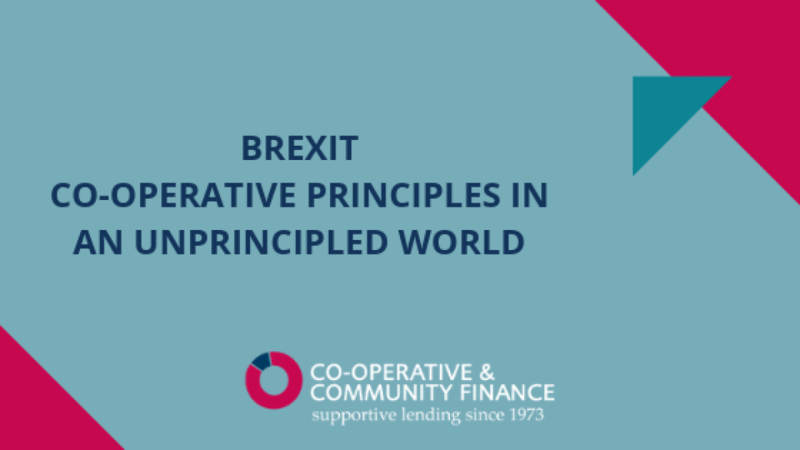 Here at Co-operative and Community Finance (CCF) we’ve been talking to some of our borrowers and partners on our co-operative horizon to try and gauge what effect any kind of Brexit may have, or has already begun to have, on them and their businesses. One thing is for sure, we’ll all be keeping the co-operative values of self-help, self-responsibility, democracy, equality, equity, and solidarity close to our hearts during these turbulent and rudderless times. With so much attention focussed on Brexit, the Government appears to be so paralysed as to be doing very little to solve the pressing challenges in our society such as homelessness, the number of people reliant on foodbanks, the housing shortage, climate change and environmental issues amongst others. When talking to our borrowers and supporters the key word we hear again and again is “uncertainty”. No matter what your position is, leave or remain, the uncertainty about what is going to happen is extremely damaging for the economy. Investment decisions are being mothballed and EU nationals that have worked in co-ops in the UK for many years are not feeling that they are welcome here any longer. We looked at some of the sectors that our funds have supported over the years and asked those borrowers involved what they think is around the Brexit corner. Areas which have had the benefit of European investment are often those that voted to leave. It is generally felt that this European regeneration money will not be readily replaced by Government and these areas of deprivation that have up to now been supported by Europe will lose out from reduced funding for infrastructure projects, business support, training and other initiatives. That said, the removal of State Aid rules could allow for more government intervention, although the idea has been floated that the Competition and Markets Authority could oversee its removal in order that any new incarnation of State Aid wouldn’t distort the market. Any co-op business that is reliant on trade with Europe is holding back on committing to investment decisions that they would otherwise make with our help, until the picture becomes clearer. It is impossible to plan when you don’t know if goods will suddenly be subject to tariffs, wild currency fluctuations or long delays at the borders. A substantial amount of EU money has supported rural areas through the Rural Development Programme for England and LEADER which has helped support the growth of Co-operative Community Businesses especially community shops and village hubs. As with re-generation areas, funding for these sectors post Brexit may be less of a priority for government. Which could make it harder to set up community co-ops in rural areas who do so much to improve access to services and reduce issues of isolation and loneliness. Most co-ops that CCF support are small and rooted in their local community and should be sheltered from the worst effects of Brexit. Although many are buying or selling products that are imported from Europe, the main effect on their day-to-day business will be as a result of a negative Brexit hit to the economy. Whilst co-ops are better placed than many to survive a downturn, it is vital for them to plan and prepare for some short to medium-term disruption both to supply chains and to revenues. Mainstream banks are unlikely to be putting themselves forward to help, so having enough cash will be important as any downturn affects the investment climate, interest rates and general prosperity. In an increasingly interdependent world, it does not make sense to walk away from the ability to co-operate with our nearest European neighbours but we are sure whatever the political fallout is co-ops will survive and be stronger.